Back Alley - thanoscardgamess jimdo page! This is a suite of two plain trick taking games, played in the US army, dating back to WW-II and Vietnam War. 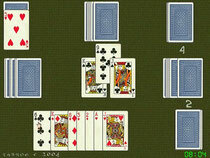 In Vietnam War Back Alley (or Back Alley Bridge), there are four players in fixed partnerships. It is used a standard 52 card pack with two distinguishable jokers, big and little, which are the highest trumps. The deal is 13 cards each in the first hand, then one card fewer each successive hand down to one card each, then rising to 13 again. Each player in turn has just one bid. If both members of a team bid a number, those numbers are added and the team's aim is to win at least that many tricks. It is illegal here to lead a trump unless trumps have been 'broken' - i.e. someone has already played a trump to a previous trick. World War II Back Alley is played with a 52 standard card pack without jokers. Here, The two of diamonds is highest trump, followed by the Ace of the trump suit. There are 14 deals in a game. In the first deal, 13 cards are dealt to each player. In each subsequent deal, the number of cards dealt is reduced by one, and the last two deals are of one card each. Each player in turn bids a number of tricks and she must win at least that many tricks. A special rule here is that a player unable to follow suit to a non-trump lead must trump. If a non-trump lead has already been trumped, a subsequent player who is unable to follow suit must beat the highest trump in the trick if possible. Also, here you may lead trumps anytime. You have the option to play that if diamonds are not trumps, the second highest trump can be the two of the trump suit, and the trump ace will be third highest.